This is the third and final part of an article on kräusening. Kräusening is adding fermenting beer to a lager that has just finished primary fermentation. The active yeast in the fermenting wort help clean up diacetyl (and aldehydhes) before the beer is lagered. The yeast also produce carbon dioxide (CO2) and this gives brewers who kräusen an option to carbonate their beer by “capping the tank” — sealing the vessel that has fermenting kräusen beer in it to trap the CO2. Commercial brewers who do this have their tanks fitted with a spunding valve — a valve that holds pressure up to a certain point, and releases excess pressure above this level. If a tank can withstand 20 PSI, the beer can be carbonated to serving levels at lager fermentation temperatures. You can try this at home, if you make your own spunding valve. In order to carbonate your beer via kräusening at home, you would need to rack your lager beer to a Cornelius keg containing the fermenting kräusen beer. Wait until primary fermentation is finished, or nearly so, to do this. 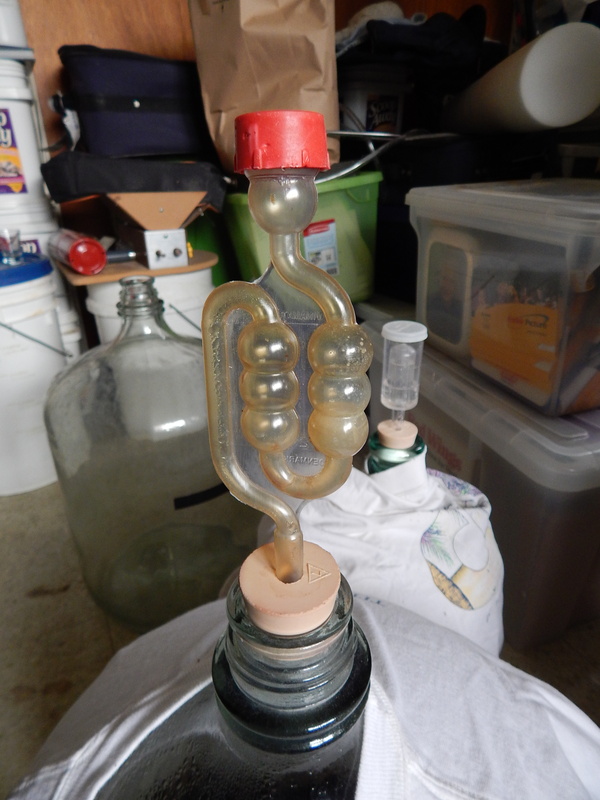 Do not attempt this in any vessel that cannot hold pressure, such as a glass carboy. The volume of the kräusen beer should be about 10% of your beer’s final volume. For example, rack 4.5 gallons (17 L) of lager beer into 0.50 gallons (1.9 L) of kräusen beer. The small column of water in this airlock means the pressure inside the carboy is slightly higher than outside. With a larger water column — perhaps made from Tygon tubing — the water column could exert even more pressure and be used as a spunding valve. The keg would eventually have to be fitted with a pressure relief valve. One way to do this would be to take a gas in fitting for the Corney keg and affix a “Y” valve. On one end of the “Y” you would put a pressure gauge that measured in a useful beer range (0–30 PSI, for example). 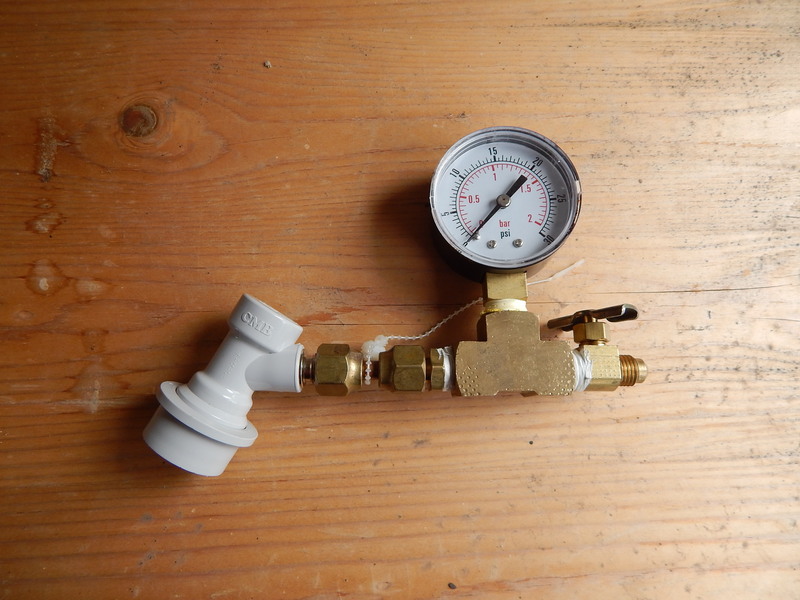 On the other end, you would place an overpressure valve in a similar range. (Places like Grainger and McMaster Carr sell these.) In the picture above, I have all the components but the overpressure valve. After racking the beer into the fermenting kräusen beer, you would first simply attach a standard airlock to the keg and let the secondary fermentation progress until it is almost finished. Then, you would cap the tank (set the overpressure valve to the desired pressure, based on the beer’s temperature and your desired level of carbonation.) For example, for a lager fermenting at 52 °F (11 °C), you would need to cap the tank at 19 PSI to yield 2.5 volumes of CO2. Commercial breweries that do this take samples of the beer and cap the tank when just enough extract (fermentables) remains to carbonate the beer, based on the expected final gravity of the beer. At home, you don’t have to be exact about this — if you cap the tank a little too early, some CO2 will just blow off as excess pressure. If you cap too late, you’ll be left with undercarbonated beer (which you can fix that when you attach your CO2 tank to dispense the beer). Lager fermentations give off foul odors initially, so don’t cap your keg as soon as you add the kräusen beer or you’ll trap noxious sulfury odors in your beer. Likewise, if you cap your keg too early, kräusen could get pushed into the spunding valve and foul it, leading to your keg being sealed. Kräusening is way to clean up your lager beer after primary fermentation. As an option, you can also use it carbonate your beer.